Sure, you may have thought that Rise of the Planet of the Apes was a nice popcorn flick. Well, for those that previously doubted that our evolutionary predecessors were never plotting to avenge the Neanderthals… behold! Steve Jobs and Dr. Zaius present the most shocking cross-branding of them all! It may has well have been the 5th Ave. Apple store in ruins on that beach! Milwaukee—city of the damned—has been the chief catalyst in granting the damn dirty apes with advanced technology, giving iPads to the orangutans at the Milwaukee County Zoo. Now two of the bloodthirsty creatures are already Apple addicts, fiending for their iPad sessions that occur once weekly (for now). Richard Zimmerman, the Executive Director of the sacrilegious Orangutan Outreach, said to a fellow human, “One of the biggest hurdles we face is that an orangutan can snap an iPad like you or I could rip cardboard.” So why would you give them such expensive toys? You stupid man! We only break/lose our expensive tech items when we’ve been drinking! Apparently the entire idea started as an April Fool’s joke (Will we be the ones having the last laugh? ), though the orangutans started showing interest in hearing stories from the devices, and then evolved to being interested in the videos and playing with the device’s front camera and its mirror-like quality. It surely won’t be long until they start wearing non-prescription glasses and excluding the orangutans not selected for iPad experimentation. 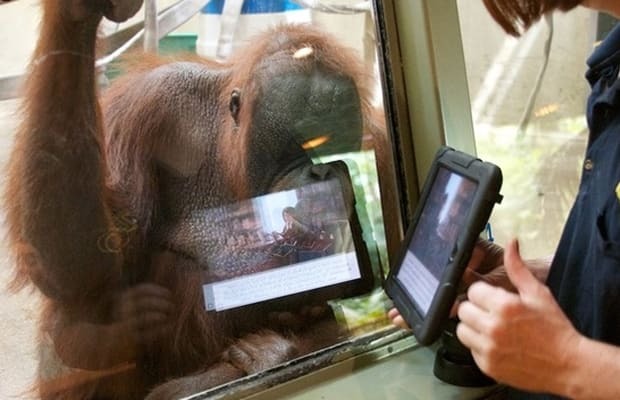 Worst part of the story: Zimmerman hopes to spread the iPad/Orangutan experiment to other zoos, so that the animals can start playing in online games and potentially compete with humans. Guess ol’ Zimmy has never seen the Planet of the Apes or King Kong. Technology, monkeys and humans don’t mix.